Only applications-driven book dealing with commerically-sponsored spatial analysis research. Focuses on business and public sector planning case studies, offering readers a snapshot of the use of spatial analysis across a broad range of areas. 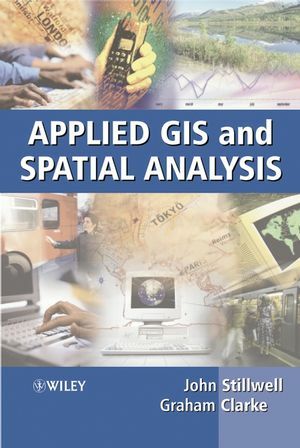 Internationally-renowned editors and contributors present a broad variety of global applications, and demonstrate GIS components and spatial methodologies in practice. John Stillwell, School of Geography, University of Leeds. 1. Introduction (Graham Clarke and John Stillwell). 2. Retail Applications of Spatial Modelling (Ken Jones and Tony Hernandez). 3. Using Spatial Models to Solve Difficult Retail Location Problems (Mark Birkin, Graham Clarke, Martin Clarke and Richard Culf). 4. Location-based Services for WAP Phone Users in a Shopping Centre (António Câmara and António Eduardo Dias. 5. Mass Appraisal and Noise: the use of Lifestyle Segmentation Profiles to Define Neighbourhoods for Hedonic Housing Price Mass Appraisal Models (Steve Laposa and Grant Thrall..
6. Target Clusters of Deprivation within Cities (Richard Harris and Paul Longley). 7. Assessing Deprivation in English Inner City Areas: Making the Case for EC Funding for Leeds City (Paul Boyle and Seraphim Alvanides). 8. GIS for Joined-up Government: the Case Study of the Sheffield Children Service Plan (Massimo Craglia and Paola Signoretta). 9. The Application of New Spatial Statistical Methods to the Detection of Geographical Patterns of Crime (Peter Rogerson). 10. Modelling and Assessment of Demand-Responsive Passenger Transport Services (Mark Horn). 11. The South and West Yorkshire Strategic Land-use/Transportation Model (David Simmonds and Andy Skinner). 12. The Relocation of Ambulance Facilities in Central Rotterdam (Stan Geertman, Tom de Jong, Coen Wessels and Jan Bleeker). 13. A probability-based GIS Model for Identifying Focal Species Linkage Zones across Highways in the Canadian Rocky Mountains (Shelley Alexander, Nigel Waters and Paul Paquet. 14. Modelling Migration for Policy Analysis (Philip Rees, A. Stewart Fotheringham and Tony Champion). 15. Modelling Regional Economic Growth by Means of Carrying Capacity (Leo van Wissen). 16. Planning a Network of Sites for the Delivery of a New Public Service in England and Wales (Mike Coombes and Simon Raybould). 17. New Methods of Assessing Service Provision in Rural England (Martin Frost and John Shepherd). 18. Forecasting River Stage with Artificial Neural Networks (Pauline Kneale and Linda See). 19. Undertaking Applied GIS and Spatial Analysis Research in an Academic Context (Robin Flowerdew and John Stillwell).